Instant Interiors offers property styling services in Bankstown. With our expert property stylist in the Bankstown area, Gail L. Dempsey, we can take on interior styling and home improvement projects in Bankstown, including home styling and decoration, promptly and professionally. We at Instant Interiors offer you professional advice to help improve your Bankstown property with creativity and innovation. We’ll help you style your property with the most creative approach, for you to find the perfect buyer the fastest way possible. At Instant Interiors, we understand how competitive the property selling market is. To help you stand out from your neighbours and surrounding area competition, we’ll assist you in making the process of your home staging in Bankstown as smooth and easy as possible. We’ll add value to your property, to maximise the selling price and have you in your new home as quickly as possible. Plus, we’ll advise as much as possible, in planning your property sales campaign. Styling a house for sale is daunting and sometimes overwhelming. However, with our team of professional stylists and interior designers, we are able to make everything simpler and with a step by step guide if you’re DIYing. Gail L. Dempsey, our skilful and passionate stylist, will give you expert advice on your colour scheme, furniture placement, and visual overall design for your space. With years of experience in property staging Bankstown, Gail knows how to enhance all areas of your property. She can visualise the potential beauty in each corner of your home. She’s practical in solving layout-spatial challenges, and she chooses the most efficient solution to every problem that may arise during each stage of property styling Bankstown. Aside from designing the layout and maximising the space in every room, styling a house for sale also involves choosing the right set of furniture and accessories that will suit the theme of your property in Bankstown. It’s of importance to pay close attention to even the tiniest detail so as to maximize your property’s selling price. To increase the price of your property, you must increase its value. By presenting your property beautifully both in person which enables stunning photographs. Instant Interior will help you achieve a property looks inviting and attractive both in person and in photographs. Therefore, potential buyers will initially be attracted by the sensational images of your property, which brings them to your ‘open for inspections’, for the next ‘touch and feel’ stage of their property purchase experience. Property styling can be an extremely expensive project, but we’ll add value and make the price affordable. The price for property staging Bankstown is calculated per room and the amount of furniture, accessories, artworks etc. 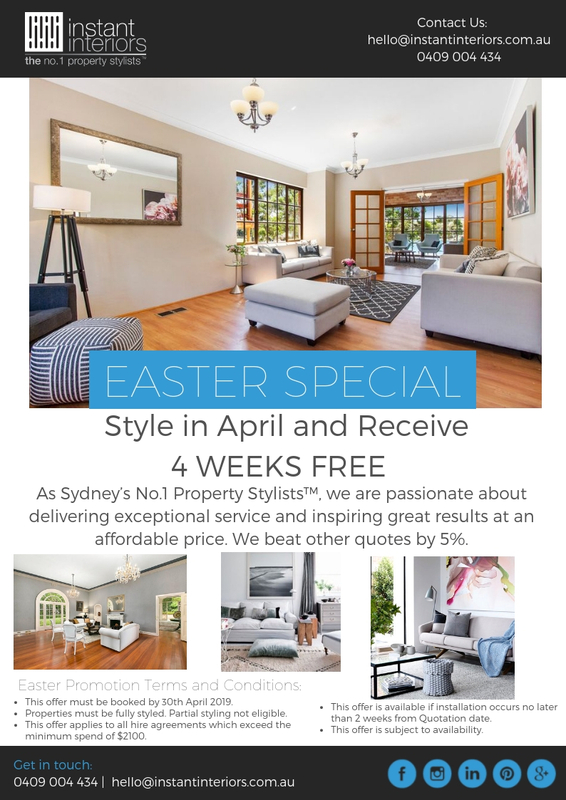 Everyone at Instant Interior is excited to help you with your property styling in the Bankstown area. Trust Instant Interiors, and let us handle your property improvement projects. Call us now for a consultation. Together, let’s discuss the future success of your property, be it to live in or to sell.